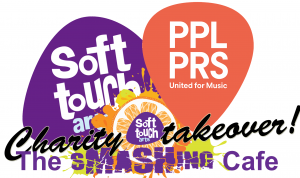 We are pleased to announce that PPL PRS Ltd Leicester has chosen Soft Touch Arts as their charity of the year! To kickstart this relationship PPL PRS Ltd are going to take over the Soft Touch kitchen and cafe bringing us a new menu and artwork. From Tuesday 10th October on set days for two weeks PPL PRS Ltd will be taking over and running our pop-up cafe. They will be designing the menu, and cooking up new culinary delights for our lunchtime cafe which usually only runs on a Thursday each week. Call in, have lunch, see the artwork, find out what PPL PRS Ltd do and support a great cause.